Welcome to Player-A-Day. The purpose of this column is to identify interesting major league players who may be fantasy-relevant in 2014. We will discuss the real-world roles the player may fill, set a range of potential expectations, identify any wild-card factors in play, and comment on how this affects the player’s fantasy value. When you take a list of the top relievers of 2013 and sort by strikeout-to-walk ratio, you come away with a Who’s Who list of the top relievers in baseball. 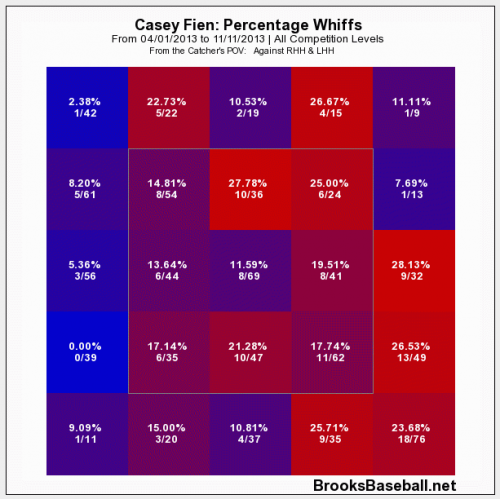 Ranked fifth and nestled between Kenley Jansen and Mariano Rivera was Casey Fien with a saucy 6.08 K/BB. This was Fien’s first full season in the majors, and it was his age 29 season . He’s been bouncing around since the 2009 season but still spent the bulk of his time in the minors prior to the breakout campaign. He’s currently third on the Twins’ relief depth chart, so he’s a bit removed from save opportunities. Owners in linear weights or holds leagues should be considerably more interested in his services going forward. Fien doesn’t possess elite stuff, so there’s reason to doubt his elite peripherals. For one, an elevated home run rate led to a 3.94 ERA, which is decidedly non-elite. His 3.16 FIP and 2.71 xFIP are much more attractive. He’s a fly ball pitcher, so if the bad home run rate repeats, he’ll post another mediocre ERA. He generally relies on a fastball and cutter while showing the occasional curveball. Below are his raw pitch counts by month followed with his whiff rates by month. He featured a robust 14.2 percent swinging strike rate in 2013. Given that he generally relied on two pitches, it might help to visualize where in the zone he got his whiffs. Or not. It seems that batters swung and missed at pitches all over the place. What we seem to have is a guy who came out of nowhere to post elite peripherals and middling results. Furthermore, we don’t really know if the peripherals are repeatable. 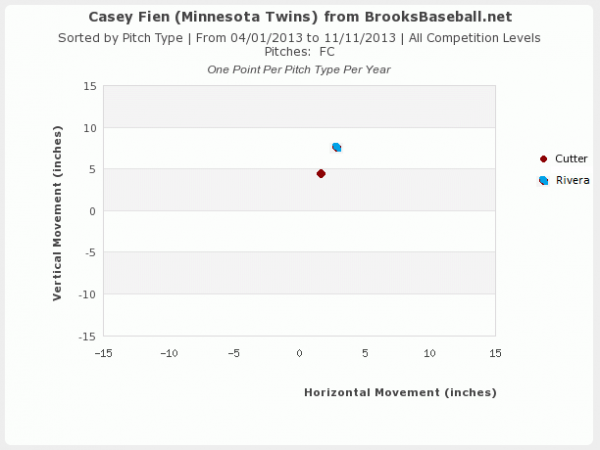 As such, Fien makes a nice flyer target, especially since he could get opportunities as the Twins closer if Glen Perkins is hurt or traded. Leagues that use an FIP based scoring system will benefit the most from Fien, although elite peripherals help in any format. Paying for Fien is a bit riskier, but he’ll go undrafted in all but the deepest leagues. Even Ottoneu leagues may leave him out in the wild to start the season. Keep an eye on his whiff rate early in the season as that could be a leading indicator on how well he performs. For now, add him to your list of bullpen names to watch.